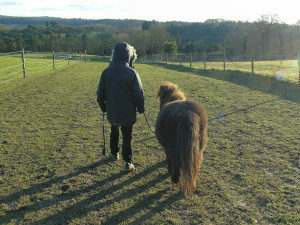 I recently had the pleasure of visiting one of the inspiring Surrey charities that we support – Mane Chance Sanctuary. Based in Compton, Mane Chance rescue neglected and abandoned horses and seek to bring them back to health, both physically and emotionally. After helping the horses to heal, they provide therapeutic benefits to visiting children with disabilities and terminal illnesses. The charity offers weekly sessions for groups of children and their carers to visit and interact with the animals, currently home to over 30 horses of varying ages. At the heart of it all is the simple concept of ‘help us help them’. The Community Foundation for Surrey have awarded funding to a number of Mane Chance projects, such as a nature pond that educates children on aquatic life, a barn that provides a safe and dry space for both uneasy horses and children, toilet and kitchen facilities for staff and visitors and core costs, to name a few. In total to date, we have allocated almost £39,000 to ensure this charity is able to continue to work with the vulnerable children and animals that are so evident in Surrey. Established almost seven years ago by the charity’s founding Trustee, Jenny Seagrove, the charity has gone on to grow significantly and becoming a place to just let children ‘be‘. Albeit one of the wettest mornings in Surrey for a while, I was delighted with my tour of this project. Wellies and waterproof jackets on, Fiona Clements, the charity’s Company Secretary, kindly led me around the fields to visit the beautiful horses and friendly staff that graced the green grass. This is where I realised that each animal that thrived here, often had a tragic history of neglect, that could have resulted in a very different future had Mane Chance not taken action. The Foundation have supported Mane Chance since the charity began and their ongoing support has enabled us to improve both the facilities we have to offer and also the services we are able to provide. We are so grateful to them for having taken an interest in the work of the charity from the outset and for supporting us over the years. One of Mane Chances’ strategic aims is to develop a global understanding of the unique relationship between horses and young people.